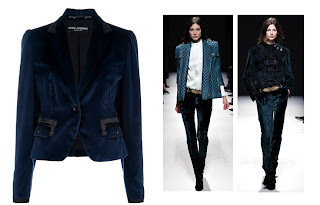 This Fall I picked three key trends which appealed to me the most. Prada's sixties prints and Fendi's colorful furs may be hot items this season, however I would go nowhere near them nor their High Street imitations. That said, embellished clothing is number 1 on my list. 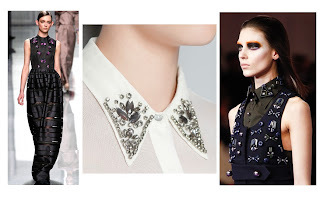 Prada, Dior, Miu Miu all introduced diamanté-embellished tops, dresses and coats. I would definitely look to High Street first: Zara already launched the above white blouse with embellished collars. Great DYI idea is to attach brooches and beads to collars of your white shirt. Second trend worth paying attention to is a velvet pant suit. Check out Oasis and Zara for less expensive fix. Personally, I would stick to timeless velvet blazer (see Dolce&Gabbana above). 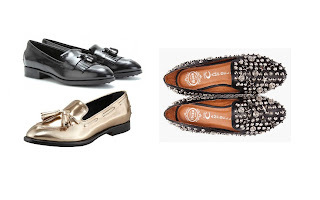 Lastly, shiny and embellished loafers are very IN and would spice up any outfit. I already snagged a pair of studded Jeffrey Campbell loafers. The above Todd's are fabulous!